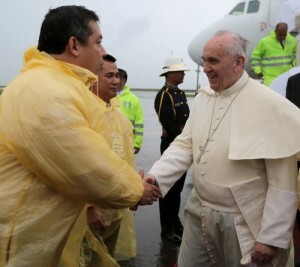 THE House Independent Minority bloc, led by Leyte Rep. Martin Romualdez, yesterday filed a resolution honoring Pope Francis for the deep and eternal concern he had shown for the welfare of the poor, the youth, and the country as a whole. Romualdez proposed to the House of Representatives to give Pope Francis the highest recognition and appreciation for his successful five-day apostolic and state visit in the country. “Pope Francis went on a five-day Apostolic and State visit from January 15-19, 2015 to personally see for himself the living conditions of victims of Typhoon Yolanda in particular, and of the poor in general, and to bless and pray for them,” the resolution read. The Pontiff’s visit to the Philippines was part of his Asian state and apostolic tour. The highlight of the Pope visit is his trip to Leyte, where he celebrated Mass in Tacloban City and then motored to Palo, Leyte to be with the survivors of the said typhoon. Although his Leyte trip was shortened due to Typhoon Amang, Pope Francis still gave hope and showed compassion to the people of Leyte by braving the strong winds and heavy rains. The independent lawmakers lauded Pope Francis as he was among the first world leaders to pray for the Fililpinos in Leyte and in other areas which were devastated by super-typhoon Yolanda. “Pope Francis also prayed for the victims of the killer earthquake that struck Bohol and of other natural calamities in 2013,” the resolution said. “In all his activities throughout his State and Pastoral visit, Pope Francis left us with his own prescriptions for our spiritual and moral rejuvenation,” it added. Other authors of the resolution were Pampanga Rep. Gloria Macapagal-Arroyo, Cavite Rep. Lani Mercado-Revilla, Quezon Rep. Aleta Suarez, Camarines Sur Rep. Diosdado Arroyo, Buhay party-list Rep. Lito Atienza, La Union Rep. Victor Ortega, and ABAKADA Rep. Jonathan de la Cruz. In a related story, Valenzuela City Rep. Sherwin Gatchalian lauded the Philippine National Police (PNP) and the Armed Forces of the Philippines (AFP) for a job well done in securing Pope Francis. At least 20,000 soldiers and reservists and 25,000 policemen were deployed to secure the Pope’s routes, as well as the venues of scheduled Papal events, in Manila and in Tacloban City and Palo, both in Leyte, from January 15-19. “The AFP and PNP deserve to be congratulated for their discipline and professionalism in securing Pope Francis. The fact that there was no untoward incident during the five-day Papal visit showed that our soldiers and policemen are hard-working and truly world-class when it comes to securing global leaders,” Gatchalian said. Gatchalian specifically lauded AFP Chief of Staff Gen. Gregorio Pio Catapang, Jr. and PNP officer-in-charge Deputy Director General Leonardo Espina for their exemplary leadership before, during, and after the five-day visit of Pope Francis. He said the successful crowd management skills shown by the PNP and AFP during the Papal visit should make them ready for similar “security nightmares” like the Asia Pacific Economic Conference (APEC) Leaders’ Summit in November. The PNP has estimated the crowd during the Papal Mass in Rizal Park to be at a record 6 to 7 million.